Reservations are required for this tour. Bicycles and helmets are not included with registration. 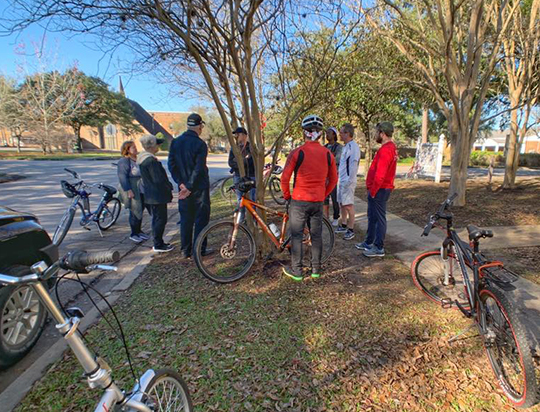 This tour explores the original foot print of the Heights, Texas’ and Houston’s first mixed-use community and home to 121 of the 279 National Register of Historic Places listed in Houston. We will look at a wide variety of building types that are historic and original to the area as well as more recent contemporary architecture and discuss how these fit into the context of the neighborhood. Attendees need to bring their own bicycle. We encourage everyone to wear a helmet. If you do not have your own bicycle, you can rent a bike from Houston B-Cycle. The closest B-Cycle station is in Stude Park. Tour will meet at the Heights Branch of the Houston Public Library, 1302 Heights Boulevard. If you drive, we ask that you park in the street and not the library parking lot, it is reserved for library patrons.